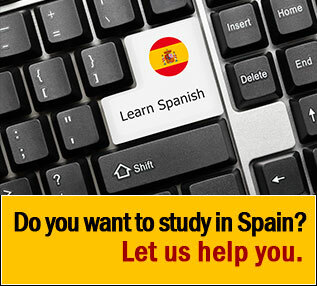 If you're thinking of extending your education and living in a unique and different culture, we highly recommend a stay in Spain, in southern Europe. Choose your Program. Use our new geo-tool to find your program in the United States or in Spain. The program was developed by the Embassy of Spain-Trade Commission Miami, with the support of ICEX España and the association EDUESPAÑA. A section dedicated to the friends of the Spanish language. More than 100 friends already! Find all the information about U.S. consulates in Spain. For more information look each institutional profile here, for programs and study abroad opportunities available for students, teachers and individuals. The activity is sponsored and fully funded by ICEX España Exportación e Inversiones and the association EDUESPAÑA, with the support of USA Study Abroad/Fulbright España. The Spain Workshop, a one-week US Delegation's trip to Spain what follows a working agenda of individual meetings in Madrid and institutional visits also in Madrid and other selected cities to be announced. Potential candidates includes Education Abroad and Global Studies Directors, Program Administrators, Faculty and Program Directors and other specialized advisers and professionals working in Direct-enrolling, Exchange, faculty-lead, Internship or any other program that includes international mobility. Engineering and Technical Careers are encouraged to participate in this edition but it is also open to any other fields such Language, History, Culture, STEM studies, Business, Finance, Law, Health, History, Humanities, Communications, Design. Check here for more detailed information, dates and registration timelimes. Workshop I: June 10-16 is already closed. Final selection in process. Workshop II: October 14-20 Registration will be announced shortly. 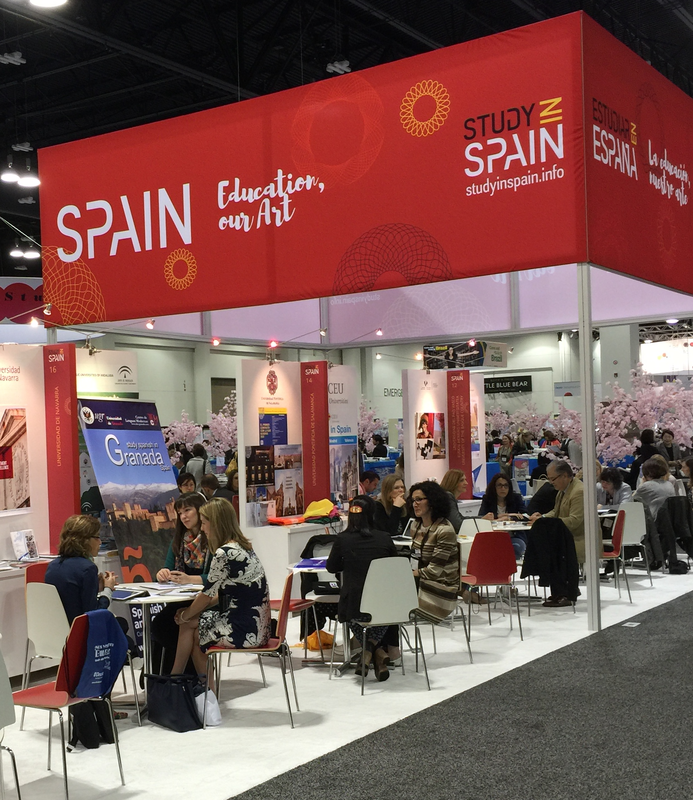 that we meet at the Study in Spain exhibits at main US international education and foreign languages conferences. Looking forward to continue our relationship and for you to count with this office and the information and resources that Study in Spain offered to the US educational institutions. Again in 2019, Study in Spain will bring you an educational offer of study abroad and faculty-lead programs, internships and work opportunities programs in Spain for undergraduate and graduate students. US Universities Delegation Meetings and visits tour. US Delegation Meetings and visits tour. This is achieved with the appointment of volunteer students that are interested in becoming the main representative of Spain and the STUDY IN SPAIN campaign in their universities. The Student Ambassador program will contribute to the development of the students' organizational capacity and leadership, while performing promotional activities and informative events directed towards promoting Spain as a destination for study abroad programs. We are looking for those students, motivated, enthusiastic, passionate about Spain, and eager to develop an activity that will add value to their resume. 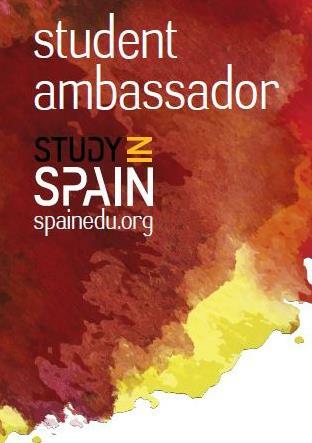 Check the designed Study in Spain Student Ambassador Facebook page. Do you want to become a Student Ambassador? If you love Spain and want to promote studying in Spain in your campus and on social networks, this program is made for you! Become our next SiS Student Ambassador. It's easy, just fill out the Student Ambassador Application Form. The Program Coordinator will contact you very soon!